The Amazing Race - Six hours before departure time, my beloved Bopper gets examined by a doctor after twisting his knee. He is given a leg brace and thankfully Bopper and Mark aren't out of this race. Teams fly 2,900 miles from Tanzania to India early in the morning, making reservations at travel agents in the wee hours of the night. The only interesting part of this is Art & JJ coming face-to-face with Dave & Rachel, who they feel betrayed by because of the U-Turn pact. And nothing happens except ignoring each other. Vanessa & Ralph arrive a smidge earlier than the other teams, but it's nothing at all once everyone lands right after basically. Teams hop on buses to get to the next clue, which is just a honkfest through Indian traffic. Mark gets carsickness sans vomit, but with a barf bag on hand. The first clue is a Road Block where one racer from the team will need to learn a choreographed Bollywood dance. Jai ho! Rachel, Vanessa, JJ, and Mark all do the dance, though Bopper/Mark start a bit behind the other teams. Tough day for them, for sure. Motion sickness and a bum leg. Blonde Rachel nails the dance on her first attempt, but most others require a couple takes to get it right. 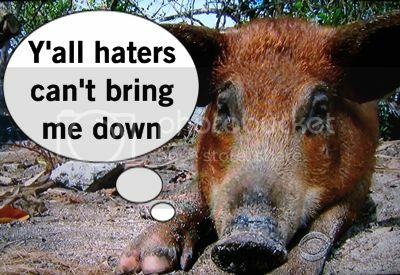 Of course, Big Brother Rachel throws a fit when she isn't perfect on her second try. These multiple attempts allow Mark to get back into the race, but it's really hot out and he's sweating like a mofo. Mark really struggles to get the dance, breaking my heart because I love him, but Bopper's an amazing teammate cheering him on and every telling him to forget about the money. The next clue is a Detour to play cricket or learn to drive a rickshaw. I've wanted to drive a three-wheeled vehicle ever since my days of playing Cruisin' World on N64 so I'd totally opt for the rickshaw. Well ahead of the other teams, Dave and Rachel drive the rickshaw and check into the Pit Stop first. They win a trip to St. Lucia. Next to check-in are Brenchel and Art & JJ, who did the cricket task. Then Vanessa and Ralph check in. Bopper and Mark are still at the Road Block and Mark insists he can get it, but Bopper wants to keep their friendship in tact and says it's OK for them to stop now. Mark quits the task, but Bopper encourages Mark after a long rest to finish up. This break clears Mark's head and he finishes the dance- yay! And all the back-up dancers cheer and hug, oh it's so wonderful. Bopper and Mark make an emotional landing on the mat, expressing their emotions, and the best news ever: it's a non-elimination leg. OMG I have never been so happy. Survivor: One World - The episode starts off with a Reward Challenge, which is a majority rules trivia challenge to knock out the other survivors. The best part is seeing an effigy of the survivors buuuuurning. The winner gets an island picnic and a helicopter (!!!) ride, which is worth it. The challenge itself is quite revealing: the majority says Christina doesn't deserve to still be in the game, Kim is trusted, Kat unanimously needs a wake up call to life, and Troyzan is a poseur. Kim wins the reward and brings Alicia and Chelsea along with her for the reward, betraying Kat. As the three stuff their faces on their reward, they realize the tides could turn because Kat and Christina got fucked in that challenge. Sure enough, back at camp Kat is pissed and Troyzan tries to explain to Kat hunger meant nothing; it was a sign of loyalty. Kat is too dense to comprehend this, but Troyzan is 100% correct. Sabrina asks Troy what his big plan would be, actually using this a way to gauge who would jump ship and it's Christina who is game for a flip. Kim returns and her first task is to smooth things over with a pissed off Kat. They make sorta amends. Oh and then a wild pig invades camp and they chase after it with a rope at ax, mouths watering at the prospect of bacon. They fail to capture the pig but the pig still sticks around camp, straight chillin'. The Immunity Challenge is to go across a Slip 'N Slide and play ring toss head-to-head, pretty much. Troyzan gets knocked out and the women go crazy with joy; Troyzan stares bitterly at the ocean. Everyone gets lubed up and slides and waddles to advance to the final round. Kim defeats her bestire Chelsea and wins immunity, which is a good call in case a mutiny did happen. Troyzan is disappointed in his loss but convinces himself to stay strong because it might not be all over, afterall they'll probably split the vote thinking he has an idol. He's right on: Kim proposes everyone vote for Troy, but two people will vote for Christina just in case. Sabrina tells Christina what is happening so that she's not completely shocked come Tribal. Christina is OK with her name going down, but also wary of the girls so discusses with Troyzan the prospect of voting off Chelsea, then stupidly tells Troyzan that she's the other name being written down tonight. If Troyzan can get one more person to write down Christina, it could change it up. Tribal Council time. Probst asks if there's talk about who are members five and six on the lady totem pole. Christina is too dense to ever get that she's not part of any of the future numbers. Alicia laughs when Christina says she's still in the game because she's lucky. Troyzan keeps spittin' the truth about the ladies and the fact that their are deeper alliances are deals. Discussions go back to Troyzan's post-reward challenge comments because again, Kat can't see past the first level of obvious. The votes are cast and after one vote for Chelsea, three in a row pour out for Troy, but he's not phased. Suddenly, it's a bombarding of Christina votes, but it's just not enough. 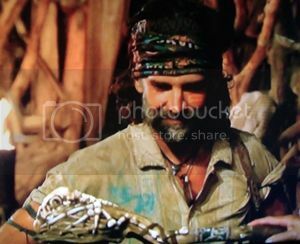 Troyzan gets the last vote, whispers to Kat "Do it," and then gets his torch snuffed.